You know when you have something in mind, maybe something you haven't eaten properly since you were a child? And you set out to make it but you're not very hopeful because you haven't eaten it for so long and recreating recipes almost never works out on the first try? That's how I felt going into plum cake. 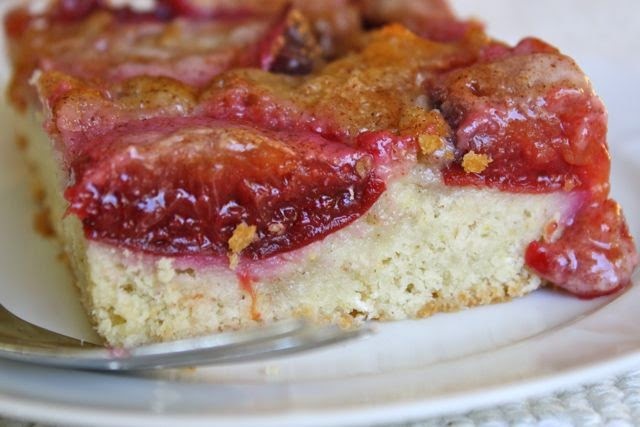 I knew what I wanted: plum cake like I had from German bakeries when I was a child. Possibly plum cake that my mother even made, although I'm not sure. What I do remember is that it had a hearty, buttery crust that was the furthest thing from a grocery-story white cake you could imagine. Plums in the top, sunken and weeping purple juice. On top of the plums there's this light crackling of sugary something. We would eat it, my mom, my dad, my brother and I sitting under the cherry tree on our front lawn, around 4 o'clock in the afternoon on a weekend when it's officially coffee time if you're German. I hadn't had such a plum cake for years, but I bought Italian prune plums at the market this week and they were just crying out for a dough resting place. 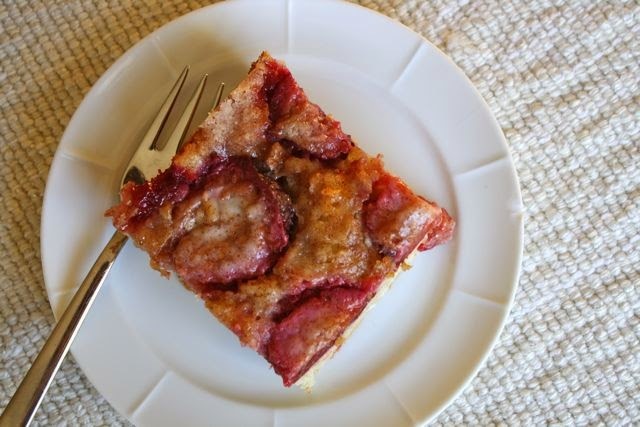 I found this recipe for fresh plum kuchen in The Essential New York Times Cook Book by Amanda Hesser. This particular cake dates from 1947, which gave me hope that it wouldn't be too modern or light. As far as I'm concerned, plum cake has heft and is not meant to be a mere wisp of cake. 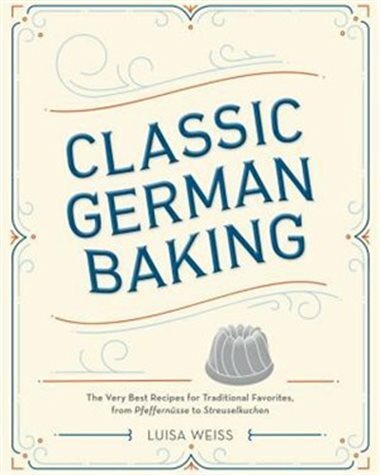 I adapted it to have gluten-free flours and sent it into the oven with a hope and prayer. 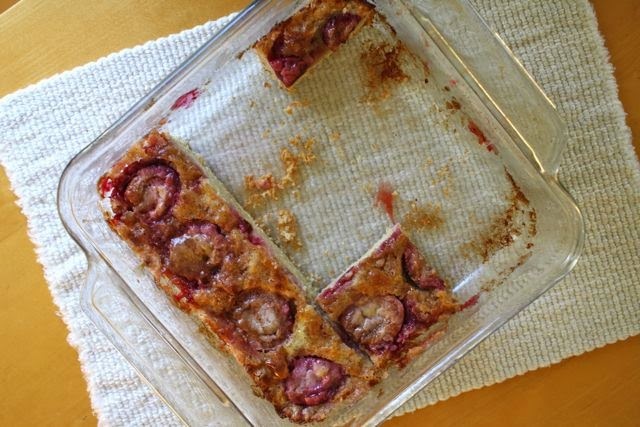 Before it was done baking, I knew it was the plum kuchen I'd been looking for. Would you believe me if I tell you that I could tell by the smell? There is something about plums with just a little bit of cinnamon that is magic. The cake itself baked into a texture I haven't encountered with gluten-free flours before. It tastes buttery but almost chewy, almost as it it had yeast in it. It is exactly what I remembered. Perhaps that's why I've already had three pieces since it came out of the oven 21 hours ago. Preheat the oven to 400 degrees Fahrenheit and butter an 8 by 8-inch pan. Set aside. To make the cake, stir the flour(s), baking powder, salt and sugar together. Cut in the butter with a pastry blender or your fingers until it looks like coarse cornmeal. Whisk the egg, milk and lemon zest together. Stir them into the flour mixture, until they're just blended to make a thick dough. Press the dough into the prepared pan, and then brush the top with melted butter. To make the topping, stir the sugar, cinnamon and flour(s) together. 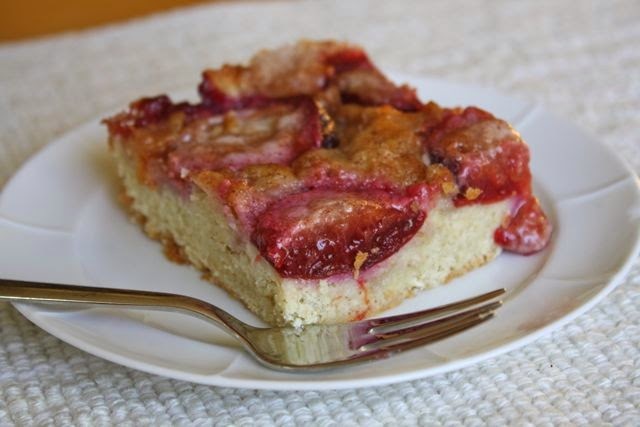 Place the plums cut side up on the dough. Sprinkle the sugar mixture over the plums. Whisk the egg yolk with the heavy cream. Drizzle over the plums and sugar mixture. Bake in the oven for 15 minutes covered, then 20 minutes uncovered (35 minutes in all). 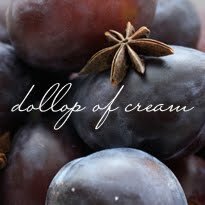 Serve alone or with whipped cream. Good job!!! Sometimes it's so hard to capture a flavor from a memory, looks like you nailed.. and a gluten free version to boot! Thanks! I'm so glad I froze some plums so that I can make again when the season is done. I'm also thinking about apricot -- but will have to wait till next summer, alas.